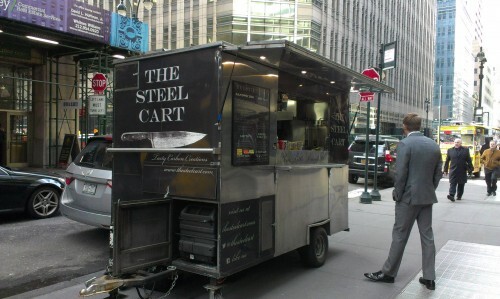 When Brian first reviewed the Steel Cart back in May, he enjoyed their glorified grilled cheese sandwiches. But for a self-described brunch cart, their brunch offerings weren’t very suited to lunch. But that’s all changed now, because they’ve started serving grits. I’ve long enjoyed grits, but they can be a pain to make and aren’t served at many restaurants in the northeast, so when I saw them on the menu at the Steel Cart, I jumped at the chance to try them. And they’re a good deal. Six dollars gets you grits and two toppings, while an extra dollar gets you unlimited toppings. Not being a fool, I put up the extra dollar. 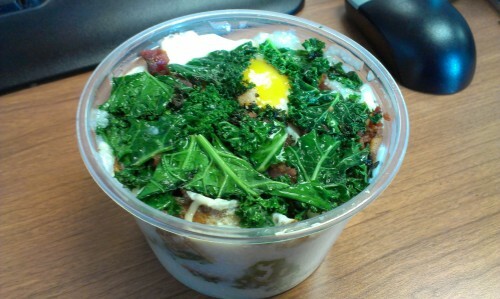 For toppings, the Steel Cart offers three cheese, smoked Gouda, Gorgonzola, bacon lardons, fried egg, kale, chipotle, and caramelized onions. 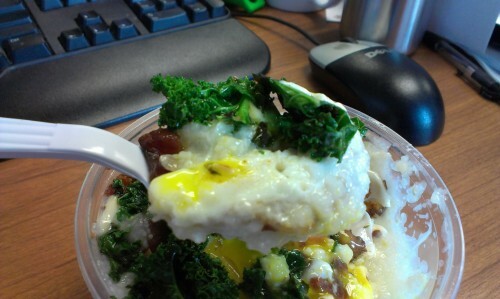 I went with smoked Gouda, bacon, and kale, with a fried egg (how could you not get a fried egg?). You get about a pint of grits for your money, which was enough to keep me mostly content until dinner. The majority of the toppings are placed on top of the grits, but there was also bacon and cheese mixed throughout, so you don’t have to worry much about rationing out toppings as you eat. The grits themselves are creamy with just enough bite, although I think they could have used some salt or pepper. Now, I know you’re all dying to know how the kale was, so rest assured that it was nicely cooked – not too raw, not too mushy. The Gouda was great, adding a smokiness that complemented the bacon. I was a bit disappointed by the bacon, only because I was expecting meaty, thick-cut lardons, but got chopped up thin slices instead. But it was bacon, and there was plenty of it, so all was well. Most importantly, the sunny-side up fried egg was cooked nearly perfectly – the yolk was set a bit too much, but that was after walking a few blocks back to my office. Grits make a great cold weather breakfast, lunch, or dinner, and are a welcome addition to the Midtown food truck scene. So if you’re looking for brunch for lunch, check them out on Wednesdays on 47th (btw Park + Madison). Posted by Dan at 9:00 am, January 22nd, 2014 under The Steel Cart.